Hi, took a break from furniture making. I just wanted to say that I find the best resources are old decorating books. Look in used book stores or flea markets. My best resource is my Ethan Allen catalog. It gives sizes and of course lots of ideas. I have gone out and measured furniture to get an average on heights, widths and lengths and keep this in a notebook to refer to. Contemporary furniture seems to be bigger in scale. It's confusing when I'm holding something that sized from the 19th century and comparing my measurements of a chair for today. I've loaded more pics of the apartment. The chair and sofa are what I am making right now to put on the CDHM.org site. I call them my Retro set. I will talk you through anything else in the room that you want to know about. Post a comment and let me know where you want to start. This room box represents what I thought would be a great first apartment back in the '70's. What a dreamer! I'm going to start on the left side and go around the room explaining what I did. To start with in the left corner hanging from the upper cabinet, you can't see it here, but I will post more pictures, is a 90 degree wall bracket. It imitates wrought iron filigree. I made it with black quilling paper. You can also cut paper 1/8" wide and paint it black. I used it for a plant hanger, the plant is in a starter bowl made from a clear pony bead. I made the plant from Fimo and the macrame hanger is buttonhole thread. In the '70's plants were very popular. The plants I made are from Fimo or florist's tape. The sink, stove and refrigerator are made just like the Vintage Kitchen's, I just made them in apartment size. The bowls on top of the cabinet and holding the popcorn are painted to look like Pyrex Ware. I made them from quilling paper also. The bathroom is just a peek, but the shelf inside is nice. I copied one from an old S&H Green Stamps catalog. It's made from quilling paper, too. Remember the stereos that folded up? This is all thin basswood and Fimo. 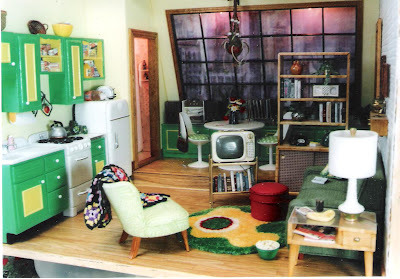 Now, the table and chairs were something I always wanted to have, I've had to settle for them in miniature! These I will explain how to do later. They are made from the little plastic champagne glasses, taller plastic wine glasses and basswood. And lots of gesso! The brick wall is just a brick red plastic brick sheet that's been painted flat white and sanded a bit in spots. The book shelf has sliding doors made from brown cross stitching paper. This makes good pegboard, I remember furniture having pegboard sliding doors. The T.V. is a copy of what I had when I first got married. It's a bit tedious, but I think it's worth trying. The rug is punch needle using embroidery floss with the loops cut off. The pictures are from catalogs and picture frame from Hobby Builders used to make the frames. The shelf on the wall has false drawers. The table is copied from and old decorating book. The lamp base I turned on a lathe and them used gesso to give it the stippled texture. We can talk about improvising a lathe. And everybody had a boomerang ash tray your aunt made at ceramics! I crocheted the afgan from embroidery floss and made the chair, couch and ottoman from pictures from old decorating books. If you have any preferences of where to start please let me know, I would be happy to oblige. This is a 1 inch scale asymmetrical settee' and it is covered in a leopard cotton print and trimmed with twisted black embroidery floss, it includes 1 black silk pillow trimmed in the same. I am under "furniture", Kris Compas. I will be using this spot for the extra furniture to be shown and you can contact me for purchase. A set of 1 inch scale slipper chairs covered in a slate blue stripe, touches of black and tan, trimmed in slate blue twisted embroidery floss. They measure 3 1/2" tall, base 1 7/8" x 1 7/8" and 2 1/2" deep, including slope of back. $15.00 for the pair. This is a 1 inch scale overstuffed chair cover in a cotton blue print, with piping made from the same fabric. This measures 3 1/8" tall, 3 1/2" wide and 2 1/2" deep. $15.00.